HYDRUS is a software package for simulating water, heat, and solute movement in two- and three-dimensional variably saturated media. The software package consists of a computational computer program and an interactive graphics-based user interface. A brief description of HYDRUS is given in the Introduction and Program Description. More detailed information is given in the User and Technical Manuals. New version HYDRUS 3.01 was released in May 2018 - see Introducing HYDRUS 2D/3D, Version 3.x. Almost 50% of the World's top 100 universities use HYDRUS for research or teaching purposes. Welcome to the website for the HYDRUS software package. 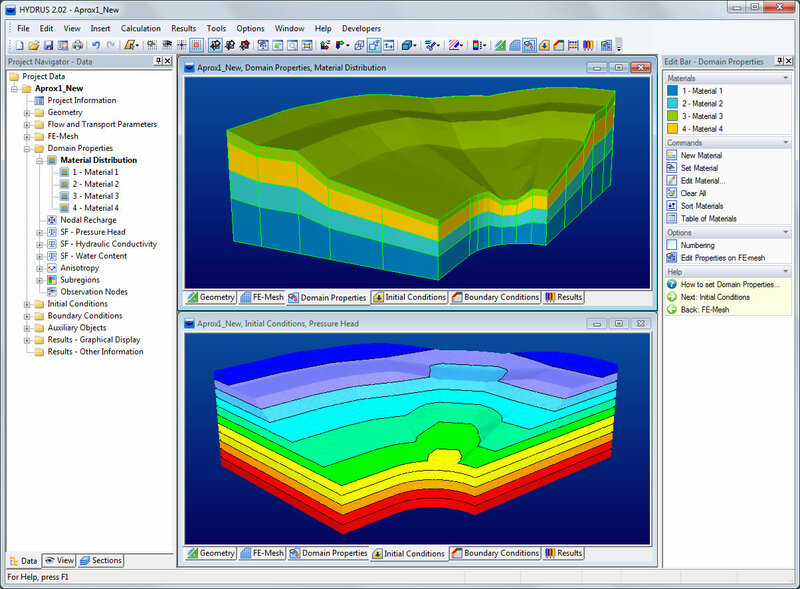 Version 1.0 was a successor of the widely used and successful Hydrus-2D / Meshgen-2D software package, originally developed and released by the U.S. Salinity Laboratory in cooperation with the International Groundwater Modeling Center (IGWMC), the University of California Riverside, and PC-Progress, Inc. This version had a completely new graphical environment for both two- and three-dimensional applications, and provided users with much more comfort than the original Hydrus-2D software package. The software was released under the name HYDRUS (2D/3D), with different versions (called Levels) covering both the two- and three-dimensional applications. Version 2.0, released in early May of 2011, is the first major upgrade of HYDRUS since 2006. In this version, we are expanding the four editions (Levels) which were available in version 1.x of HYDRUS, namely 2D-Lite, 2D-Standard, 3D-Lite, and 3D-Standard, with a new additional Level 3D-Professional. The 3D-Professinal Level will enable you to define transport domains of virtually arbitrary 3D shapes. Another major improvement that should significantly improve the effectiveness of working with HYDRUS is an option to specify various domain properties, and initial and boundary conditions, on Geometric Objects, rather than on FE-Mesh. We have also implemented two new solute transport modules (UNSATCHEM and Wetland) for evaluating the transport of major ions and for simulating processes in natural or constructed wetlands. There are also many other additional improvements and expansions of the model. Version 2.02, released in September 2012, offers three additional add-on modules: DualPerm for simulating two-dimensional variably-saturated water movement and solute transport in dual-permeability porous media, i.e., preferential and nonequilibrium water flow and solute transport, C-Ride for simulating two-dimensional colloid-facilitated solute transport, and HP2, which couples Hydrus (its two-dimensional part) with the PHREEQC geochemical code [Parkhurst and Appelo, 1999] to create this new comprehensive simulation tool (HP2 - acronym for HYDRUS-PHREEQC-2D), corresponding to a similar one-dimensional module HP1. Version 2.03, released in September 2013, uses new fonts improving the look of HYDRUS GUI on Chinese, Japanese and other similar Windows systems. This version also brings a number of new functions. Version 3.0, released in early May of 2018, is the first major upgrade of HYDRUS since 2011. In this version, we have included a new flexible Reservoir Boundary Condition, expanded Root Growth features, and added many new graphical capabilities of the GUI. Detailed description of new features and changes in Version 3.01 of HYDRUS (2D/3D) are given in Šimůnek et al. (2018). HYDRUS provides users with a great deal of flexibility, as it allows them to acquire only the segment of the software that is most appropriate for their particular application. Table 1 contains a description and pricing of the five available HYDRUS Levels. Users can select software limited to two-dimensional problems, or for both two- and three-dimensional applications, and can also opt for relatively simple or more complex geometries. Users can upgrade to higher Levels, as well as from earlier versions of HYDRUS 2D/3D (i.e., version 1.x) to newer versions. Multiple user licenses for up to 20 PCs are double the price of a single license. You can download a Demo Version of the entire HYDRUS software from our web site and obtain a license (authorization codes) directly from us, or from other distributors. You can also freely download the Technical Manual, which contains detailed mathematical descriptions of problems that can be addressed with HYDRUS, numerical solutions of the governing equations, descriptions of the computational modules, and many example applications for verification purposes. The User Manual is also free to download, and provides descriptions of the main components of the graphical user interface, as well as many software related details (such as the main dialog windows, commands, and menus). The demo version is installed with selected examples that are described in the Technical manual. Additional examples (for Version 1 and Versions 2 and 3) can be downloaded as well and copied into HYDRUS workspaces as is described in the User Manual. Note that we will continue to further expand the library of these downloadable projects. This web site offers many other tools that may be helpful especially for beginning HYDRUS users. We continue to provide the Frequently Asked Questions (FAQ) and Discussion Forums where users can obtain answers to most of the more common questions as well as be able to share their experience, pose questions, and seek guidance for specific applications. We will continue to actively support these tools. You can also view simple demos (for Version 1 and Version 2) that illustrate the use of the new HYDRUS software, accompanied with brief explanations of particular commands and actions. Additionally, we provide a list of references so that potential HYDRUS users can see additional examples, in which HYDRUS has been applied in the past, and existing users can find help with their own applications. To further improve the software, we welcome your feedback about HYDRUS, including any problems and errors that may still be present in this version. The HYDRUS software has been developed by leading (award winning) scientists in the field of vadose zone hydrology (Rien van Genuchten and Jirka Simunek). Note that both of them are Fellows of AGU (American Geophysical Union), AAAS (American Association for Advancement of Science, SSSA (Soil Science Society of America) and ASA (American Society of Agronomy), which are the highest awards given by these respective societies. Both these scientists are one of the most widely cited researchers in their field of science, having an h-index of 66 and 56 (in 2018), respectively, and tens of thousands of citations (both according to Web of Knowledge). Always at the cutting edge of the most recent developments in vadose zone hydrology. According to the Web of Knowledge (ISI), the “Highly Cited” or “Hot” manuscripts are manuscripts that has received enough citations to place them in the top of either 1% or 0.1% of papers in their field, respectively. The HYDRUS software is used by thousands of users around the world (over ten thousand of downloads in 2017 alone, and many more before and since then), including leading research institutions, regulatory agencies, and consulting companies. The HYDRUS software has been used in thousands of successful applications published in peer-reviewed journal articles (1D, 2D, and 3D). There exist many successful examples of HYDRUS verifications and validations. There are hundreds of resolved problems in the HYDRUS public library of projects (1D, 2D, and 3D), from which HYDRUS users can learn how to use HYDRUS in their particular applications. The HYDRUS software is easy to use and learn as there are the many free 1D and 2D, and 3D tutorials. Both HYDRUS developers are organizing short courses organized around the world. Also see the recently released HYDRUS textbook and HYDRUS Tutorial eBook. There are thousands of registered users in HYDRUS discussion forums allowing them to share their experience and learn from others. The HYDRUS software has been linked to other widely used programs in their respective fields of applications (e.g., MODFLOW, PHREEQC, Wetland Module, DSSAT, and Rosetta). No other software for subsurface hydrology can match any of these accomplishments. Langergraber, G., and J. Šimůnek, The Multi-component Reactive Transport Module CW2D for Constructed Wetlands for the HYDRUS Software Package, Manual – Version 1.0, HYDRUS Software Series 2, Department of Environmental Sciences, University of California Riverside, Riverside, CA, 72 pp., 2006.